Are there stains or odors on your sofa, carpet, or mattress? These and other non-launderable items are often subject to high amounts of wear and tear from kids, pets, and day-to-day living. Dry cleaning can be expensive, and some items aren’t able to be dry cleaned. Here’s how to remove dirt, stains, and odors at home. Wet a corner of our Wash & Stain Bar and use it to clean a small area of the item. Or, dab a small, inconspicuous area with a Lint-Free Cleaning Cloth and a small amount of Stain Solution . • The fabric ripples or wrinkles. If you see any of the above reactions, stop spot treating. If the item requires further cleaning, have a professional clean the item in-home. How to Spot Treat: Wet the Wash & Stain Bar. Gently work a lather into the affected areas. You may also use Stain Solution on a clean, wet Lint-Free Cleaning Cloth. Use warm water, regardless of the fabric. Do not use paper towels and certain types of sponges because they may leave lint or residue behind. Remove soap and dirt. Dampen cloth (as needed) and repeat the process until satisfied. Be sure to remove all soap. To prevent water rings from appearing, iron the treated area using a dry pressing cloth to soak up excess water. Freshen: Freshen and deodorize the sofa by steaming and spraying with Fabric Fresh Classic 8 fl oz or Home Spray. Remove lint: Cohabiting with lovable, furry pets? Use the Pet & Lint Brush to eliminate fur and pet hair from upholstery. Items such as upholstery, drapery, carpeting, and mattresses are often not launderable via traditional methods. 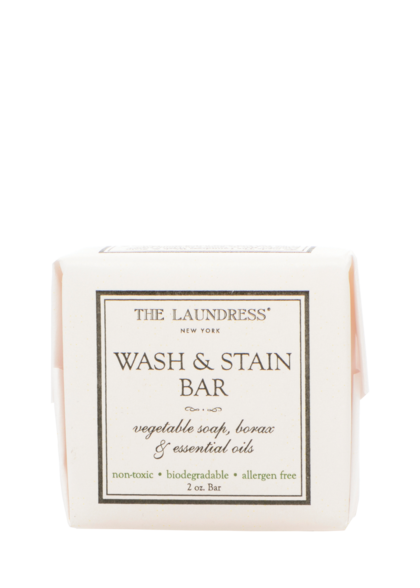 The Laundress offers options for safely treating stains and odors on these items to the best of our ability. For more tailored advice for your individual item, contact the manufacturer.